We are full speed ahead. 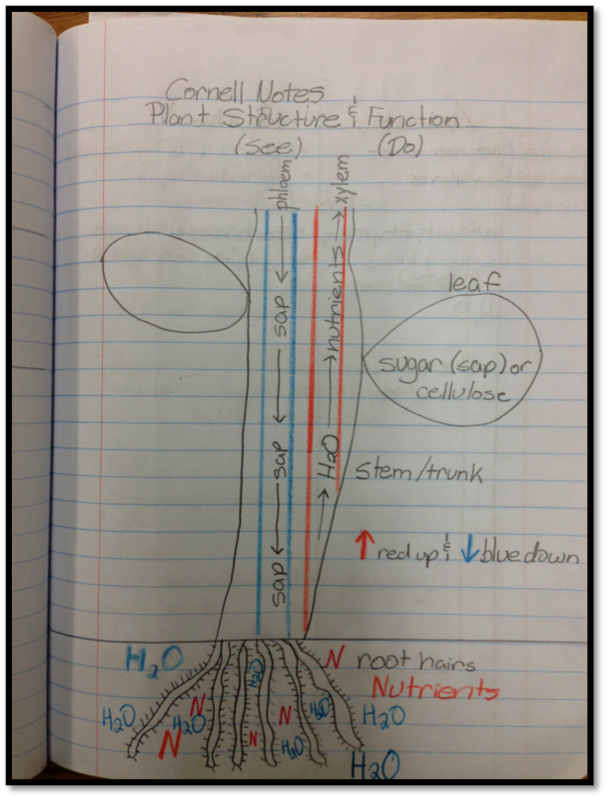 We are currently working on vascular plants, their similarities and differences to the human circulatory system and the interdependence of both. 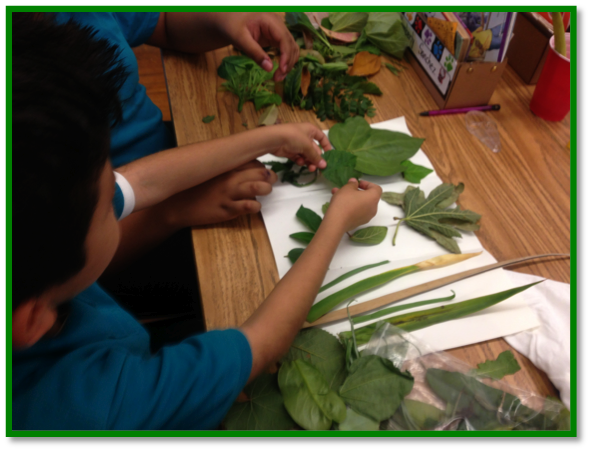 We have covered the functions of different parts of the plant, especially the xylem, phloem, and photosynthesis in the leaves. In our first investigation, we looked at how the vascular system in plants moves fluids and nutrients throughout the plant. 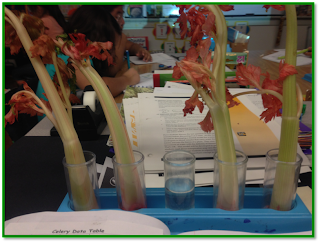 We did this by looking at 4 celery stalks: 2 with leaves and 2 without leaves. 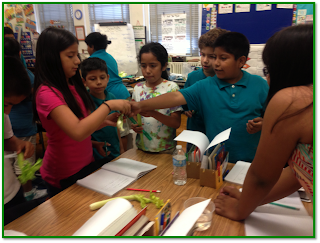 Students had to design and conduct a scientific investigation. They weighed the stalks at the beginning of their investigation, drew pictures and filled in a table in their scientific journal. 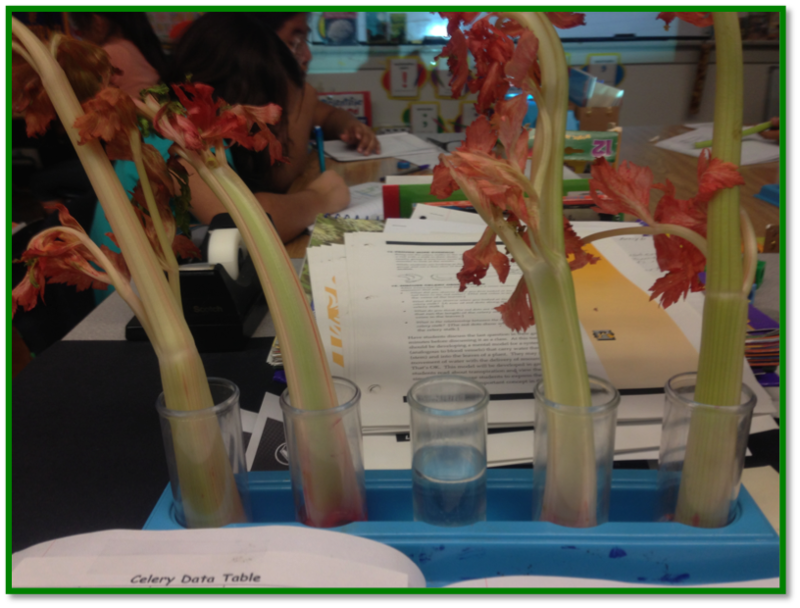 Students then added 25mL of water to one stalk with leaves and one without leaves in a beaker. beaker. They repeated the weigh in at the end of the investigation. They discovered that leaves play a very important part in the transport of water. They then wrote down their conclusions in their journals. 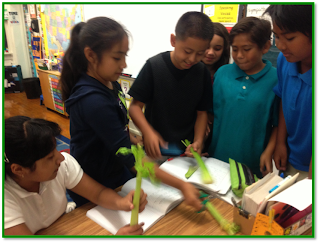 One group had very "different" results and we discussed the possibilities for those dramatic differences: incorrect weigh-in, leaning the stalk in a different direction on the scale (this creates great differences), incorrect measurement of water at the beginning, or even spillage of water. They cut the stalks to about 10 inches in length. I had 4 stalks, all in water, and with red food coloring. 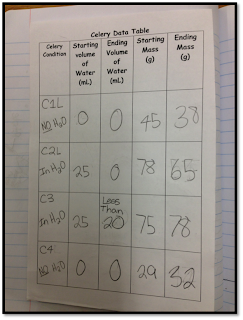 I also had a beaker with 25 mL of colorless water to measure how much water had been absorbed. The transportation of fluids from the "roots" upwards to the leaves was very evident and for some, it opened up a whole set of questions regarding the change of leaf color. We discussed the "Why". Some students wanted to duplicate at home with different liquids and/or food colors. Some students tried it with marker ink and Kool-Aid. 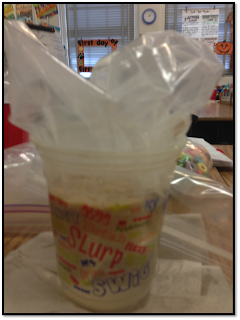 We found out that the liquid was NOT moving up the stem as fast (even after a couple of days). This lead to great hypothesizing about the reason why. I love it when they have lots of questions brewing in their minds. Our second investigation consisted of students collecting different types of leave in a baggie. They arrived the next day eager to find out how we were going to use the leaves. I gave them time to draw some of their leaves, to use their magnifying glasses to make observations and compare the leaves they had brought. 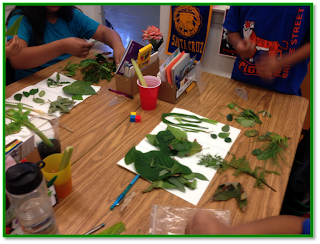 I them asked them to sort and classify the leaves any way they saw fit. Some sorted by size and others by shape. 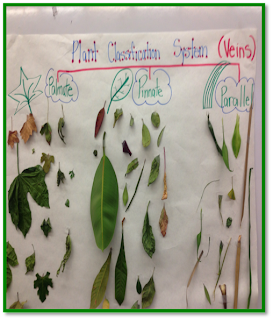 We discussed why it is important for scientists to have a classification system for plants. We decided that it is important to have a system in place in order to study the organism in question, to learn more about it , to make sense of things/information, AND because it makes it much easier when everything is arranged in an orderly way. We therefore decided to sort and classify the leaves by the type of veins it possess. Our third investigation dealt with going deeper into exactly how and where fluids and nutrients re transported in plants. We began by watching a magic School Bus video. Students created a diagram of a plant. 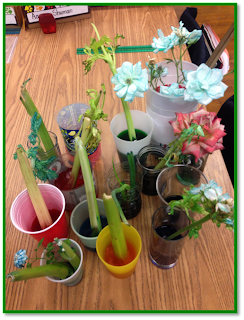 We used two different colored straws: one for the xylem and one for the phloem. We added stickers with a G(glucose/sap), W(water), and tiny stars for nutrients. We have gone over Photosynthesis as a chemical reaction that occurs only in the leaves inside the chloroplast. 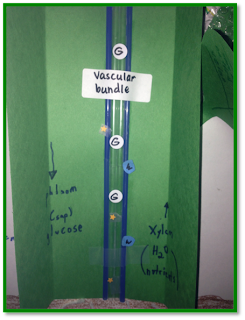 We have also acted out the path of the fluids, glucose and nutrients throughout the plant with very simple props. This really helped my kinesthetic learners. 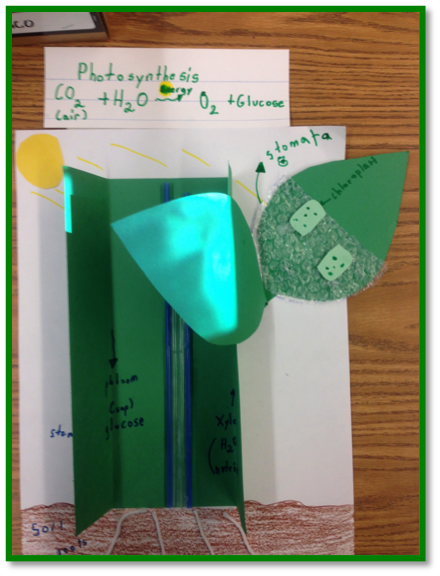 I got the idea for the inside of the leaf as an interactive component from this FABULOUS science website by Eve Heaton: http://sciencenotebooking.blogspot.com She has some unbelievable notebook ideas. I am over there quite often. 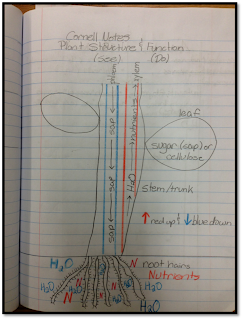 Students will now be adding descriptions to their diagrams and the functions of different parts of the plant. We analyzed under what conditions plants make food. After many readings, short videos on BrainPop, and The Magic School Bus: Gets Planted, they understood that plants need water, O2 and energy from the sun to make glucose. 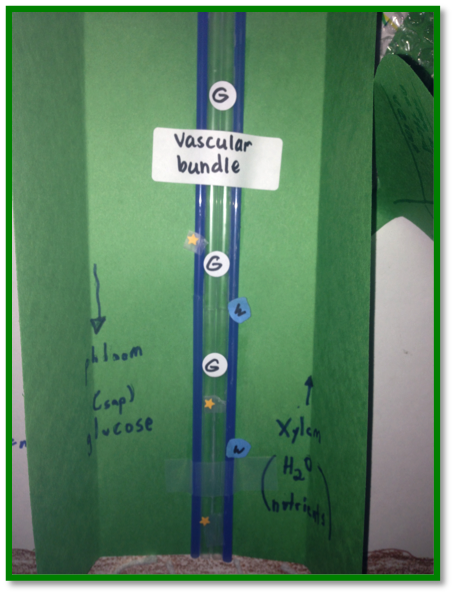 As a way to test whether or not glucose is important for plants, the students conducted an experiment in which they investigated what was necessary to activate yeast (from our FOSS kit). 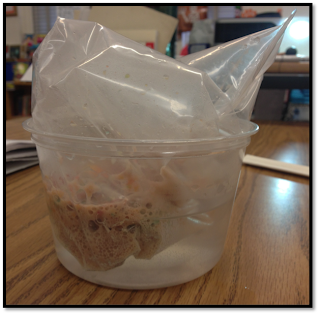 They took two 1 liter plastic bags and filled them with 50mL of warm water, 5mL of yeast, and 1 of the bags had 2 crackers. Both bags where then placed in a warm bath for 10 minutes. After ten minutes, the students compared the bags. One bag had water vapor but nothing had occurred. The bag with the crackers had gotten puffy (inflated). 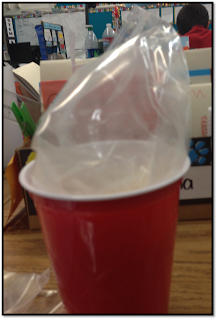 They concluded that the bag with air is evidence that a reaction occurred--yeast is alive and active. The cookie (sugar) had provided food for the yeast, the plain water had not. The next investigation dealt with testing the amount of sugar in the cereals we consume at home. 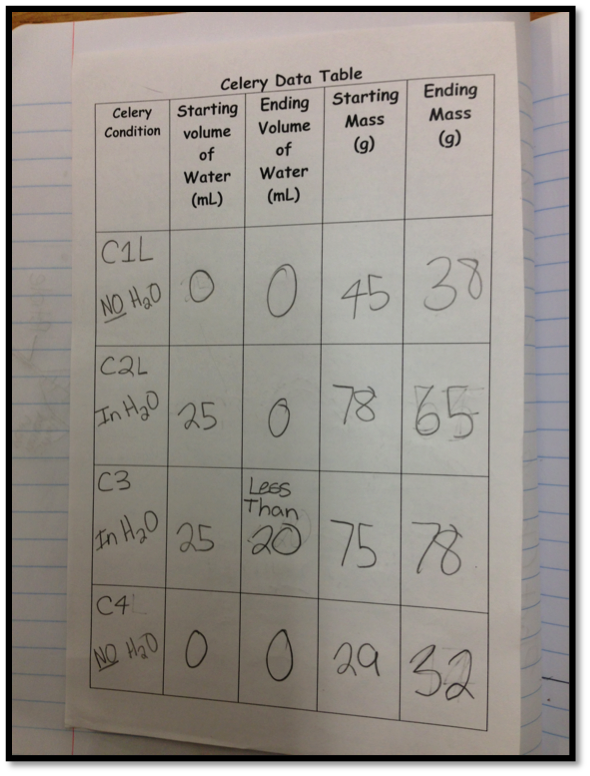 Captain Crunch, Frosted Flakes, and Trix had the greatest volume of CO2 when we measured it with the volume tubes--600+. Cheerios had the least volume--between 50 and 100. This was a big eye-opening investigation for the students. They could not believe that their favorite cereals contained sooooo much sugar. Some even said they would no longer be eating their favorite cereal. This of course are the results we gathered and they were not duplicated to draw definite conclusions. If any else does this investigation, let us know your findings. 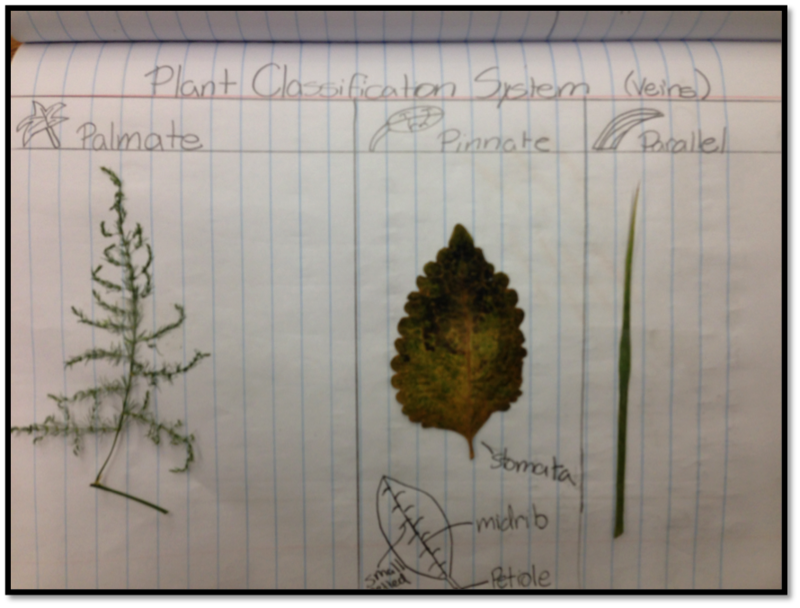 We will complete our unit by looking and comparing the cells of plants and animals. I have some ideas and other edible projects in mind that I have collected on Pinterest that I am dying to try. 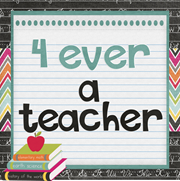 What other things have you done in your classroom that has helped your students to fully understand the content?